Cloud chasers enthusiasts can have a lot of fun with this one, as the Aspire Cleito 120 RTA System comes with a larger build deck which makes it possible to create complex coil builds. Cloud chasers enthusiasts can have a lot of fun with this one, as the Aspire Cleito 120 RTA System comes with a larger build deck which makes it possible to create complex coil builds. This versatility in complex coil builds works well for vapers who are heavily invested in discovering varying flavour intensities. Vapers will definitely be satisfied with this model, as it comes with a single coil build adapter. Aspire Cleito 120 RTA System not only allows experts have fun with building complex coil options, it also allows new vapers have an easy installation procedure. 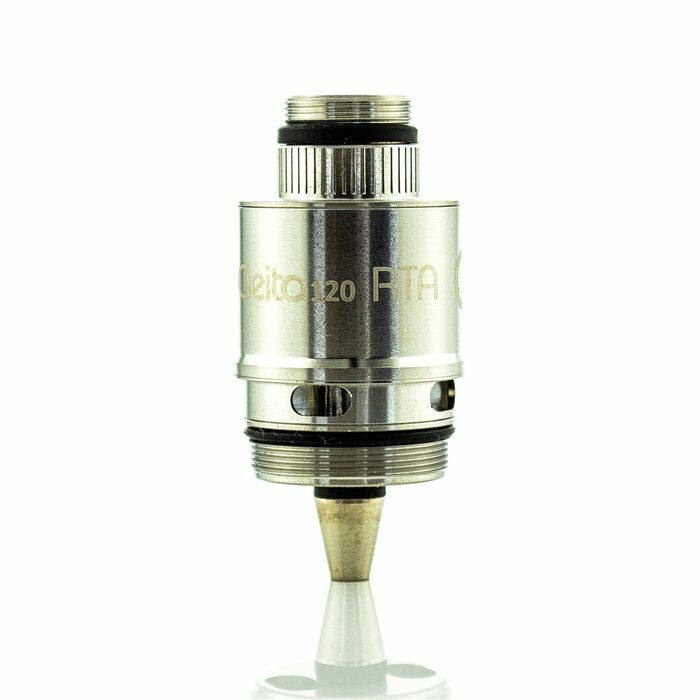 This tank atomizer comes with pre-built coils making it twice as easy and pleasurable for beginners. This dual velocity style post deck design has an adjustable airflow option, great for vapers who want increased vapour production. The flexibility of the Aspire Cleito 120 RTA System is unrivalled as its stainless steel exterior, complete with a glass tank supports dual and single coil builds making it possible for users to have a varying number of options.